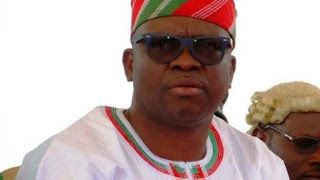 The Pioneer Chairman of Peoples Democratic Party in Ekiti State, Clement Awoyelu, has accused Governor Ayodele Fayose of being overbearing and lacking respect for the party’s constitution. He also said the governor lacked respect for party leaders in the state, hence, the need to reclaim the party from him. Awoyelu, a member of the Board of Trustees of PDP spoke during the swearing in of the Chief Williams Ajayi-led faction of the State Executive Committee of the party in Ado Ekiti on Thursday. A Federal High Court sitting in Ado Ekiti had on Tuesday ordered the Independent National Electoral Commission to recognise and deal with the faction pending the final determination of a suit before it. It restrained the commission and the PDP National Secretariat from relating with the faction loyal to the governor where Gboyega Oguntuase had emerged as the state chairman. The former Senate Deputy Chief Whip, who claimed he had no personal grudge with Fayose, said reclaiming the party from the governor remained the best option to save the party from imminent destruction. “I have been in the party politics for more than 50 years and that is why we are trying to restructure our party. We will never sleep until we reclaim our party from Governor Fayose. We are ready to correct all the wrongs in our party. “I have grouse with Fayose in two ways: One, I have never seen a state where governor will be the one to appoint councillorship candidates. This is wrong because it is the duty of the party leaders. He disobeyed the party guidelines. “Secondly, the governor has appropriated the party to himself. The governor has not attended any meeting at the party secretariat, instead he relocated the party to his house in Afao Ekiti. This, we will not tolerate. “I have been a member of the PDP National Executive Committee since 1998. Presidents Olusegun Obasanjo , Umaru Yar’Adua and Goodluck Jonathan were attending meeting at Wadata Plaza in Abuja. But this is not so under Governor Fayose. “Governor Fayose was not in Ekiti when we formed PDP. He didn’t know anything about PDP. And we thank God that the election of the new SEC and the verdict of the court have shown that God and the people have rejected the governor. We have reclaimed the state from him. “As SEC of the party, you have nothing to fear because the court had validated your victories. You should ensure unity in our party and bring every aggrieved member on board,” he said. A former envoy to Canada and Secretary to Ekiti State Government, Amb. Dare Bejide, urged the new SEC to instill discipline in the party and make it a formidable force to be able to win elections. Ajayi assured the party leaders that he would pursue unity and ensure that the party stood united. Bejide hinted that the verdict of the Federal High Court had validated the mandate of the faction.